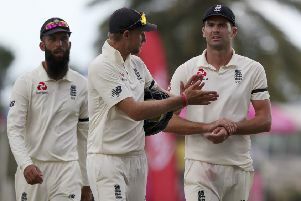 MARK WOOD admitted he finally felt worthy of his England shirt after a barnstorming show of pace brought him a career-best haul in St Lucia. 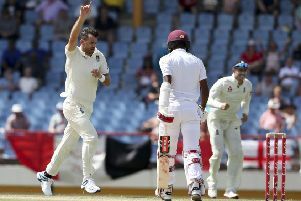 Wood hit the accelerator in a dazzlingly quick spell of bowling on day two of the third Test against the West Indies, inching towards 95mph on the speed gun and wrapping up a maiden five-wicket haul to help dismiss the host for 154. After a tormented tour of the Caribbean, Wood’s efforts ensured England were the day’s clear winners for the first time since arriving, 142 ahead with their openers 19-0. The 29-year-old seamer’s ability to hit express speeds has long been known but this was the first time he has channelled his gift to such consistently devastating effect. His previous 12 Tests, the last of which came in May, included 30 wickets at a disappointing average of 41.73 and had him pondering his own readiness for the top level. Nobody is asking those questions now. “I’ve had some horrible dark days with injuries and things like confidence and self-belief...I thought in my own mind I was an England player but I hadn’t shown it,” he said. Today I felt like I showed I am an England player. It’s nice to show some people who’ve probably doubted me in the past, I’ve even doubted myself that I can do it, but I wouldn’t say I’m out of the woods yet. Joe Root’s decision to summon a weary Wood back with the West Indies nine down was a subtle but brilliantly effective piece of captaincy. The Durham man has long coveted a five-wicket haul in the Test arena and, after picking up four in his lightning first spell, he needed just two balls to scatter Shannon Gabriel’s stumps and complete the job. His previous high in an England shirt came in 2015 when he removed Nathan Lyon at Trent Bridge to ensure England reclaimed the Ashes. “Everyone wants to take the winning Ashes wicket, don’t get me wrong, but if I could trade that feeling in for a few more five-fors I would,” he said. Wood was engulfed in a bear hug at the close by Steve Harmison - his fellow Ashington native, long-time friend and bowling mentor. Harmison’s Test best figures of 7-12 came in Jamaica 15 years ago, but Wood was claiming bragging rights on one crucial statistic. “Harmy’s really pleased and he’s a guy that’s done pretty well in the West Indies before,” said Wood. “I’m still a couple of wickets shy of what he did but somebody has just said to me I’ve pipped his top speed so I’m pretty happy about that.